Here's a side scrolling platformer that I absolutely hated on my first playthrough due to its frustrating gameplay and over-reliance on trial-and-error. However, I gave it another chance and I'll admit it did grow on me. The game consists of seven worlds with four levels each (apart from World 7 which is just a fortress battle with the final boss). Enemies can kill you with one-hit but there's a number of weapons you can pick up including an axe, boomerang, fireballs and arrows. You must keep an eye on your health meter as it constantly depletes and the only way to stay alive is to pick up the fruit that's scattered around the levels. Despite its cute graphics this is actually an extremely difficult game! The core mechanic basically involves dying repeatedly before finally memorising each and every level. It can be frustrating and it's mainly due to enemy placement as they seem to appear just as you're about to make a tricky jump. There's also times when a lightning fast enemy will run up from behind you and it's almost impossible to avoid it unless you know it's coming. Thankfully there are unlimited continues and you start back on the same level that you just played rather than the beginning of the world. In the fourth level of every world you'll reach a boss. These aren't too tough but if you die you're taken right back to the start of the level - luckily each one is quite short. I do like that you get you choose your preferred weapon just before you reach the boss as you'll find that certain ones work best for particular fights. If there's a consistent theme to each world I couldn't tell as the setting seems to change erratically from one level to the next. The cut-scenes are very, very strange with Master Higgins hula dancing and dressing as a ballerina in full makeup! The graphics are beautiful with a huge, bright palette that really shows off how many colours the Turbografx-16 can have on screen at once. The animation is smooth and there's lots of attention to detail such as Master Higgins' hat blowing in the wind when he sprints. I've seen people complain about the music but it's actually pretty good. The issue is that you die so frequently you'll hear the same track dozens of times before you progress - by this point you're sick of it! 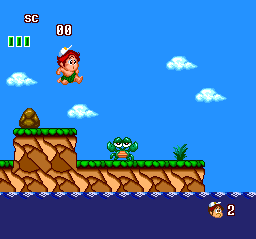 Don't be fooled by New Adventure Island's aesthetics; it's an extremely difficult game and one that will frustrate you. It does rely too heavily on trial-and-error rather than straight-up reactions but like Mega Man (NES) it grows on you and you'll feel like your gaming skills have improved by the end! Random trivia: If you don't own a Turbografx-16 and want to play this game it's also been released on the Wii's Virtual Console (2006) and PlayStation Network (2009).